Lisa joined the firm in 2004 having obtained an Honour’s Degree in Law and Accounting from Queens University Belfast. Lisa qualified as a solicitor in 2006 and was promoted to an Associate Solicitor in January 2017. 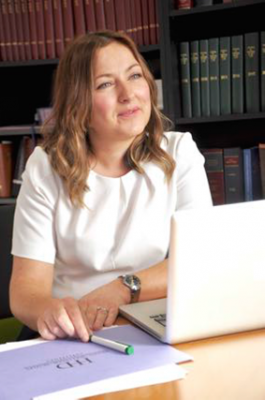 Lisa specialises in Conveyancing, Administration of Estates, Wills, Commercial Property and Liquor Licensing. Within conveyancing Lisa advises clients on house sales, purchases, re-mortgages and on transfers of equity. She has strong links to all local estate agents to ensure your sale or purchase transaction is a straightforward and smooth process. However should issues arise, Lisa has experience in dealing with boundary disputes, rights of way and adverse possession. Lisa is on the co-ownership panel of solicitors and various lender panels. She is familiar with stamp duty exemptions for first time buyers and the government ISA bonus scheme. Lisa also advises clients on Landlord and Tenant issuesincluding Rental Agreements and Buy to Let purchases. The conveyancing calculator on our HHD website ensures that personalised quotations for conveyancing work are offered to include all outlay and no hidden fees. Lisa understands that making plans for your passing can be an uncomfortable experience, but she will sympathetically and efficiently guide you or your representatives in all aspects of this matter. She has experience of non-contentious and contentious wills and has drafted many high value wills and trusts. She has experience in drafting Enduring Powers of Attorney and Controllership Applications. She has considerable experience in commercial property law and has represented clients throughout Ireland in a number of high value transactions. She has drafted leases for clients ranging from a corner shop to an office block and advises commercial clients on a range of issues from pavement cafѐs to licence agreements. Lisa also advises clients on Liquor Licensing, regularly supporting local publicans and restaurant owners with renewal applications and extension applications. Lisa is a member of the Elder Law Group of the NI Law Society, the Belfast Solicitors’ Association - www.belfast-solicitors-association.org and the Law Society of Northern Ireland - www.lawsoc-ni.org. HHD is a member of the Law Society Home Charter Scheme. Lisa works with many charities on behalf of HHD and regularly attends NI Hospice giving talks to carers’ groups and also at Belfast City Hospital. Lisa has donated her time and expertise at HHD for many years by taking part in annual will weeks or months for Action Cancer, Will Aid and NI Hospice.